Rice cakes are ubiquitous in Korean cookery and easy to find in Korean markets in different shapes and sizes. While every Korean market will have a variety of frozen rice cakes, some markets may even have freshly prepared cakes. The flavor of any shape of rice cake will be primarily of rice, but the texture may vary with the shape of the cakes. Thinly sliced flat rice cakes will be considerably less chewy than thicker, tube-shaped versions. Your own preferences will dictate which shape of cake you most enjoy. Make rice cakes from scratch or toss store-bought rice cakes directly into a traditional kim chi stew. Sift the rice flour to remove any lumps. If the rice flour does not contain salt, add 1/2 tsp. of salt and sift or stir it into the rice flour. Combine the rice flour with 1/2 cup of water and knead together until a soft, smooth dough forms. Cover the rice dough ball with a wet cloth to prevent it from drying out while you form the rice cakes. Cut off small pieces of dough and form them into the rice cake shape of your choice. For example, flat rounds, tube shapes or balls. Bring water to boil in a saucepan large enough to accommodate your steamer basket. Line the basket with fresh pine needles, banana leaves or cheesecloth to prevent the rice cakes from sticking while they steam. Place the rice cakes in the steamer basket in a single layer. Make sure none of them are touching or they will fuse together as they cook. Cover the rice cakes with a cheesecloth or the steamer basket lid and steam them for 40 minutes. Rinse the rice cakes with cold water and use them in the recipe of your choice or store them in the freezer. Soak frozen rice cake pieces in cold water for 1 hour to thaw and then cook them in boiling water for about 5 minutes, until soft. Preheat a skillet or wok over medium heat, and add sesame or peanut oil, soy sauce and chili paste. Toss fresh store-bought rice cakes or thawed, cooked rice cakes in the wok with the sauce mixture and any other ingredients you wish. Stir-fried vegetables or meat make a great accompaniment. Stir fry all of the ingredients until they are well coated and seasoned – about 2 to 3 minutes. Splash rice vinegar in the wok or skillet to deglaze the pan near the end of cooking for extra flavor or if the pan begins to dry out. You can freeze your homemade rice cakes right after cooking them. First, place the cakes in a single layer on a plate or baking sheet and put them in the freezer. Once they've frozen completely, store them in an airtight container. Rice cakes will keep in the freezer for several months, if they are completely airtight. You can also pan-sear the thawed rice cakes and dip them in the sauce of your choice. 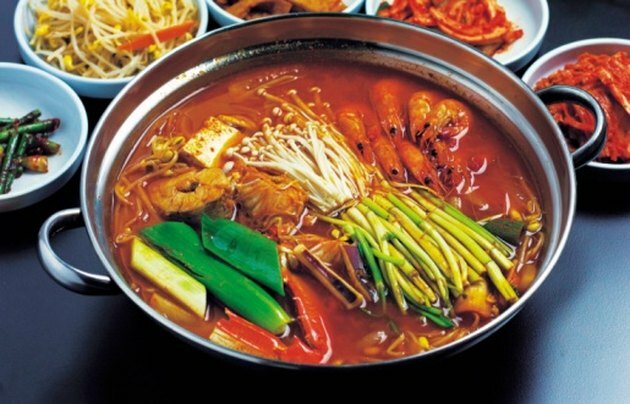 Add dimension to kim chi soup or hot and sour soups by tossing sliced, frozen rice cakes into the soup during cooking. Are Japanese Rice Crackers Healthy?